Description: In this volume, a leading expert brings readers up to date on the latest advances in New Testament Greek linguistics. Stanley Porter brings together a number of different studies of the Greek of the New Testament under three headings: texts and tools for analysis, approaching analysis, and doing analysis. He deals with a variety of New Testament texts, including the Synoptic Gospels, John, and Paul. This volume distills a senior scholar's expansive writings on various subjects, making it an essential book for scholars of New Testament Greek and a valuable supplemental textbook for New Testament Greek exegesis courses. Citation: Hector Obed Martin Fuentes, review of Stanley E. Porter, Linguistic Analysis of the Greek New Testament: Studies in Tools, Methods, and Practice, Review of Biblical Literature [http://www.bookreviews.org] (2018). 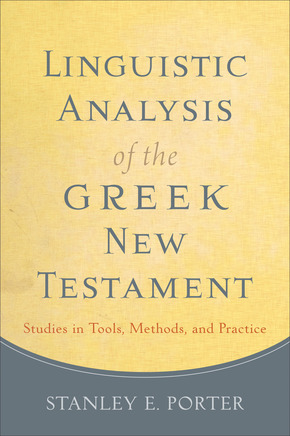 Citation: Jacob Bullock, review of Stanley E. Porter, Linguistic Analysis of the Greek New Testament: Studies in Tools, Methods, and Practice, Review of Biblical Literature [http://www.bookreviews.org] (2019).